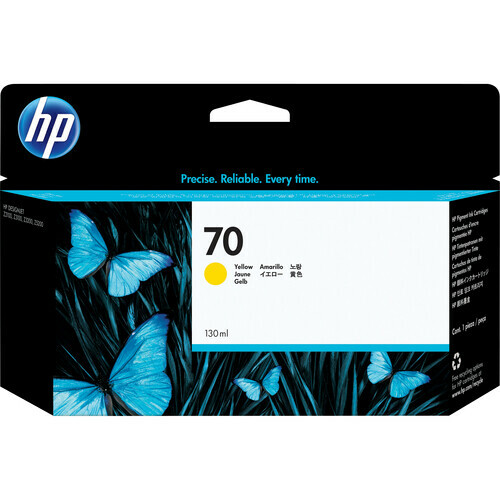 Box Dimensions (LxWxH) 8.05 x 5.15 x 1.55"
70 Yellow Ink Cartridge (130 ml) is rated 4.8 out of 5 by 4. Rated 5 out of 5 by Emotive Expressions Printing from Yellow ink, in a cartridge! So, apparently there's a chance to win $1000 if I review this ink. Neat. It's ink. It's very yellow. It comes in a cartridge. Strongly recommended if you have the printer to put it in. Great for daffodils and other yellow stuff. Rated 5 out of 5 by Peter from Works as advertised This is really just a consumable, but I find the color set for the Z3100 quite satisfying so always replace with genuine tanks. I would like if some colors I don't use as much came in a smaller size. Rated 4 out of 5 by Duane from Hi-Cap OEM The cartridge (not B&H fault) is kind of pricey, but has a MUCH higher capacity than than the out-of-the-box cartridge.